Sometimes when you’re framing a photo you don’t have the luxury of making sure the composition is perfect, and some unwanted objects may inadvertently end up being present. But instead of resigning yourself to the fact that they’re there – why not remove them instead? With a bit of editing it is possible to remove unwanted objects, but the tricky part is making sure that no traces remain and the rest of the photo looks like they were never there in the first place. The good news is that even that is a lot easier than you might think with Movavi Photo Editor. 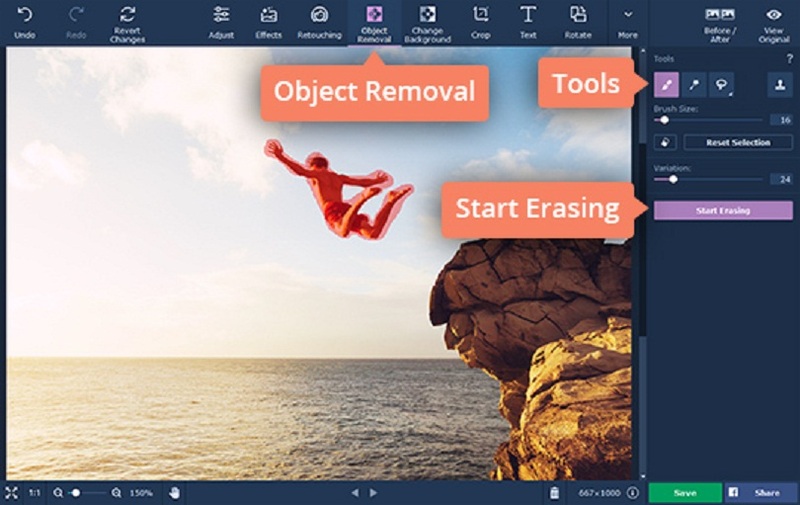 If you’d like to see how easy it is to remove unwanted objects from photos using Movavi Photo Editor – why not try it out for yourself? Just launch the editor and click on the ‘Browse for Images’ button and select one of your photos that has an object you’d like to remove. Next, open up the ‘Object Removal’ tab in Movavi Photo Editor so that the panel containing all the tools you need appears on the right. In that panel you should then select the ‘Selection Brush’ tool, and use it to paint over the object that you’d like to remove. Try to be as precise as possible, but if you have difficulty you could try the ‘Magic Wand’ or ‘Lasso’ instead, or use the ‘Selection Eraser’ to remove any unwanted marks. Once you’ve marked the object, click ‘Start Erasing’ to have it removed. If there are any imperfections left behind, you can use the ‘Stamp’ tool to mask them by copying another part of your photo and applying it to that area. If everything checks out, click ‘Save’ to have Movavi Photo Editor save the photo. As you can see it really isn’t that complicated at all, and more importantly you should be able to easily select and remove any object, person, or other element from your photos without leaving traces behind. In fact with the features in Movavi Photo Editor you could do far more than that, and you may want to enhance the quality of your photo, apply artistic filters, replace the background, touch up portraits, transform the frame and orientation, and so on. Make no mistake, being able to remove unwanted objects from a photo will definitely come in handy as it can help you to vastly improve the frame and composition of your shots. That being said if you try the full spread of features in Movavi Photo Editor, you’ll be able to do much more – and could make sure that all your photos are shown in their best light and really do look stunning.